Getoutofthefastlane, under jockey Jose Figueroa, easily winning his trial for the Bitterroot Derby Saturday at Les Bois Park. BOISE, ID�JUNE 6, 2015�Bryon Goody's homebred Getoutofthefastlane rolled to a 1� length trial win Saturday afternoon at Les Bois Park to post the top qualifying time for the 2015 Bitterroot Derby. Three of the 10 finalists are sire by Royal Vista Ranch stallions. The 10 fastest three-year-olds, from the three trial races contested, will return to the Northwest raceway on Saturday, June 20th and vie for the winner's share of a $40,000-est. purse going 400 yards. Making his 3-year-old debut, Getoutofthefastlane, under jockey Jose Figueroa, drew off handily while completing the 400 yards in :19.864 seconds, a 94 speed index with a 3 mph tailwind. It was the second win in four starts for the IVORY JAMES 3-year-old. Goody bred the brown gelding in Idaho from the Streakin La Jolla mare Cruel Summer. Michael Monson is the trainer. Another IVORY JAMES colt, James First Affair was a three/quarter length winner in the second trial to post the third fastest time of :20.075 seconds. James Hanson saddled the stakes-placed colt for owners RTM Stables LLC, Larry Chapple and Robin Dunn. Eddie Aceves had the riding call aboard the Tom Bradbury and Kim Kessinger Oklahoma-bred. Rtm Mr Caccia finished third in the second trial to post the sixth fastest time of :20.144. 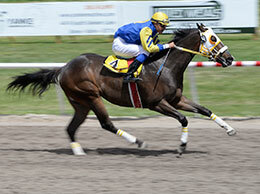 Also trained by Hadley, the NO SECRETS HERE gelding races for owner RTM Stables, LLC. Susan Hadley bred Rtm Mr Caccia in Idaho from the Dashin Is Easy mare Shirleys Secret. For the complete list of Bitterroot Derby qualifiers, times, sires, dams, owners, breeders, trainers and jockeys CLICK HERE.